The collapse of the INF Treaty was caused by the US and Russia’s mutual suspicion and their fear of rising powers not covered by the treaty. 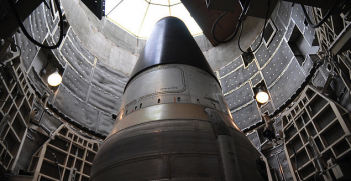 Its demise heralds a less stable and more uncertain future for arms control. 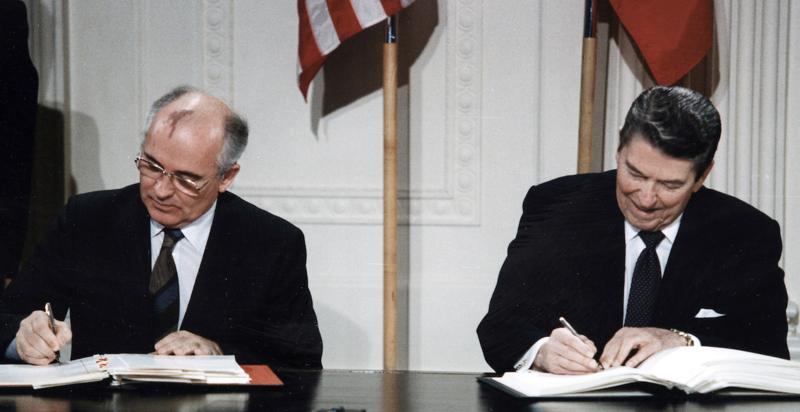 The Intermediate-Range Nuclear Forces (INF) Treaty was signed in 1987 between Ronald Reagan and Mikhail Gorbachev, and it prohibited the United States and Soviet Union – and its successor state, the Russian Federation – from developing, testing or deploying land-based ballistic and cruise missiles and launchers with ranges of 500-5,500 kilometres. It was rightly hailed as a landmark event in arms control and resulted in the destruction of thousands of missiles and warheads. One can see the remnants of some of these outside the United Nations building in New York: a striking statue of St George is slaying an enormous dragon, the latter created from metal fragments of Soviet SS20 and American Pershing missiles destroyed under the terms of the treaty. US President Donald Trump withdrew from the treaty on 1 February, and President Putin followed suit the next day. There is a provisional six-month period during which both parties can choose to come back into compliance with the terms of the agreement, but this seems highly unlikely. In truth, the INF has been limping along for several years, and its end, while regrettable, is not especially surprising. But the end of the INF is nonetheless a portent of a more dangerous world, where both parties are now free to deploy openly the kind of missiles originally deemed to be destabilising to European security. And with long-standing tension between these states, that is not a good thing. The immediate cause for termination of the treaty was the US objection to Russia’s deployment of its Novator 9M729 land-based cruise missile, which almost certainly violates the terms of the treaty, exceeding the INF range limit of 500 km. This has been a concern for some time, and there is little doubt that Russian actions created the tipping point for Washington to withdraw. But there have also been long-standing concerns in Russia about the placement of land-based missile launchers in Eastern Europe, part of US missile-defence plans, but seen by Moscow as having the potential to be used as offensive weapons in a conflict. As seen from the Kremlin, over the past twenty years, the United States and NATO have undertaken numerous initiatives that underscore the threat from the West: NATO expansion into Eastern Europe and the Baltics; NATO partnership programs with states throughout the former Soviet Union; improvements in conventional, missile defense, and nuclear capabilities; support for antigovernment uprisings and regime change around Russia’s periphery. Such fears may seem absurd to us, especially considering Moscow’s wars in Georgia and Ukraine, its takeover of Crimea in 2014 and suspicions of Russian interference in Western elections, but they are real fears nonetheless. Russia has long seen itself as the injured party in geopolitical developments after the end of the Cold War. For Moscow, strategic calculations mean that land-based short- and intermediate- range missiles are increasingly important for Russian security. With NATO close to its borders, air- and sea-based missiles have much less relevance. By contrast, American air- and sea-based missiles – which are not banned by the INF treaty – do give Washington an advantage over Moscow, which fears attack from both close as well as long range Western forces. Thus, while both sides claim violations of the treaty, in Russia’s case there is also a very real advantage in ending an agreement which had banned weapons now seen as necessary for its security. But there is a further grievance that has led to the demise of the INF treaty, and it is one shared by both the US and Russia: in the 30-odd years since Reagan and Gorbachev signed the agreement, several other states have developed land-based missiles with ranges of 500-5,500 km. China, India, Pakistan, North Korea, and Iran, all benefit by not having any such legal constraints placed on them. There are of course global norms against developing and testing such missiles, with the Missile Technology Control Regime and the nuclear Non-Proliferation Treaty designed to limit missile and nuclear weapons proliferation, but these constraints are routinely disregarded. 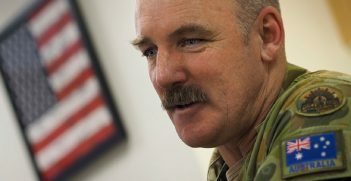 Thus, for Washington and Moscow, an INF agreement which continues to limit their missile deployments while not applying to other, newly-rising states is seen as a “Cold-War relic.” China has developed a range of conventional and nuclear-capable missiles which fall within the 500-5500 km range and some analysts in Washington believe this, at least as much as Russian violation, is what has prompted US withdrawal. But there are others who believe that ending the treaty will not do much to counter China anyway, and that it only plays into the hands of Putin who has long sought an end to the INF. For a start, Russia will be free to continue with its deployment of short and medium range land-based missiles. While Putin has criticised Trump’s decision to withdraw from the INF, this has been disingenuous, as Moscow clearly stands to gain from the end of the INF. If the United States wants to match Russian moves, European NATO partners are unlikely to allow any new missile systems to be placed in their territory. This is one reason why there has been so much criticism of Washington’s decision: it terminates an imperfect agreement without allowing for any new constraints or discussions with Russia. The wider ramifications of the end of the INF Treaty are also important: we might, for example, see a new nuclear arms race develop between China and India, as the former continues its trajectory of missile development. At a global level, the end of the INF suggests trouble ahead: with US-Russian relations at a very low point, we need more transparency and confidence-building mechanisms, not fewer. The INF might not have mattered much in real terms given long-standing non-compliance, and its application only to the US and Russia was certainly disadvantageous to these states. But there is currently very little which binds these huge nuclear superpowers together in the greater goals of arms control and disarmament, or indeed in any kind of serious global cooperation. The New START treaty which reduces strategic nuclear arms – that is, those missiles and weapons which have a range greater than 5,500 km – between the US and Russia, is due to expire in 2021. Deteriorating relations, and counter-accusations over INF do little to engender confidence that this important agreement will be continued. Trump and his National Security Advisor John Bolton seem unwilling so far to begin talks on extending New START. It is this overall tendency to withdraw from agreements, rather than the flaws with the INF itself, which is the real worry. Trump’s record – remember also his renunciation of the hard-won Iran Deal, where European allies were left wondering about US intentions – might put America first, but it suggests a very dangerous time ahead. Marianne Hanson is associate professor at the University of Queensland and director at the Rotary Centre for International Studies in Peace and Conflict Resolution. With Donald Trump's recent threat to "totally destroy" North Korea, Australia may have to closely examine its military obligations under ANZUS, should the US go to war. 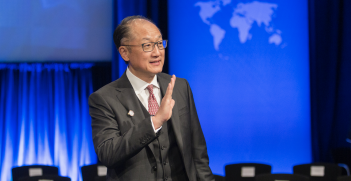 The resignation of World Bank President Dr Jim Kim has triggered controversy over who should replace him. Australia’s Labor Party has given “in principle” support to the ban on nuclear weapons, but it needs to go further.